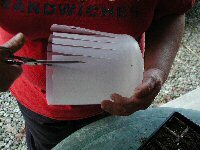 Use these plant markers made from plastic jugs to mark your plants in the seedling trays or the garden. Did you ever just get busy planting things and all of a sudden remember that you hadn't marked what was planted where? Then you scramble around to find something to make the plants with. 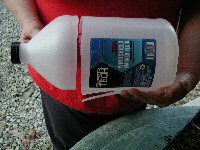 Here is a simple way to make durable plant markers from old plastic gallon size jugs. The first step is to cut the top or bottom off of the plastic jug. Then cut the markers to the desired width. Finally, cut them to the desired length. Cut them as long as you can and then you can trim them later. You can use any plastic jugs to do this with. Also, if your house is like ours, souvenir cups seem to multiply overnight. These will also make handy plant markers. 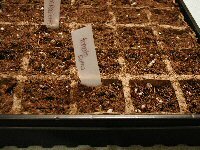 Of course, you don't get the handy funnel, but if you're careful, you can still use the bottom of the cup for starting seeds. We'd be careful not to use any jugs that had weed killers or any other toxic chemicals. Also, make sure that you thoroughly clean out the jugs before using them.